The Yellow-crowned Amazon Parrot aka Yellow-fronted Amazon (Amazona ocrocephala ocrocephala) is native to the rainforest areas of Northern South and Central America. They are found in the Amazon Basin and Guianas - Northern Brazil, Venezuela, Middle Amazonia, Eastern Andes, Colombia and Trinidad. Localized populations exist in north-western South America and Panama. It is mainly a lowland bird, but has locally been recorded up to 800 m (2600 ft) along on the eastern slopes of the Andes. These Amazon parrots favor tropical forest areas (both humid and dry), woodland, mangroves, savanna and may also be found on cultivated land and suburban areas. 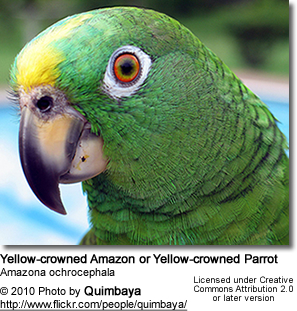 There are several subspecies of Yellow-crowned Amazons, including the Yellow-naped Amazon. Yellow-crowned Amazon - A. ochrocephala - nominate group - East-central and south-eastern Colombia, Venezuela, Trinidad, Guyana, Suriname, French Guiana and the northern and eastern Amazon Basin in Brazil. 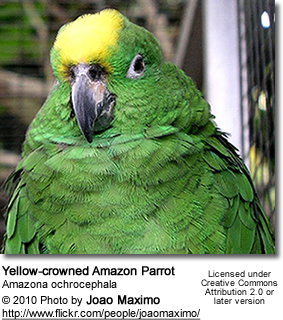 Amazona o. xantholaema:Marajó Island, in the Amazon River delta of north-eastern Brazil. Amazona o. nattereri: Far south-eastern Colombia, eastern Ecuador, eastern Peru, northern Bolivia and south-western Amazon Basin of Brazil (east to around Mato Grosso). Often included in A. o. ochrocephala. Yellow-naped Amazon A. auropalliata-Southern Mexico to north-western Costa Rica. Amazona a./o. parvipes: Mosquito Coast in eastern Honduras and north-eastern Nicaragua. Amazona a./o. caribaea: Bay Islands, Honduras. Yellow-headed Amazon Amazona oratrix oratrix: Pacific and Gulf slopes of Mexico. Greater Yellow-headed Amazon Amazona oratrix magna - previously A. ochrocephala magna - Carribean Side of Mexico. Most authorities consider this sub-species invalid, instead including this population in oratrix. However, the taxonomy is extremely complex and future changes / clarifications are anticipated. 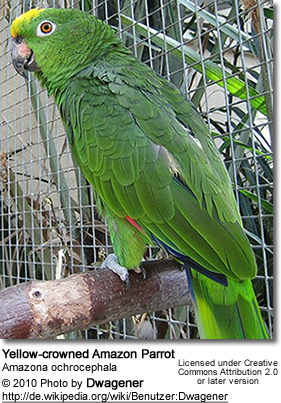 This parrot averages 13 - 15 inches (33 - 38 cm) in length, including its short squarish tail. 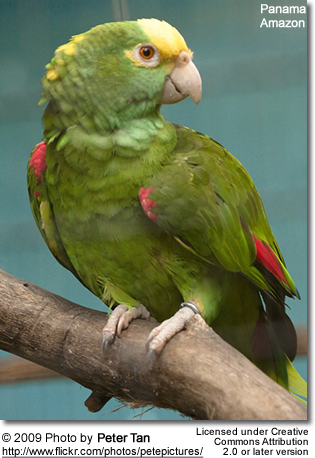 Like most Amazons, its plumage is mostly green; There are rainbow markings in many areas. Yellow markings can be seen at the crown, lores (the regions between the eyes and bill on the side of a bird's head), and thighs, and can occasionally be seen in the areas around the eyes. The amount of yellow to the head varies, with nominate, nattereri and panamensis having yellow restricted to the crown-region, although occasionally a few random feathers can be seen around the eyes. However, the subspecies xantholaema has most of the head yellow. 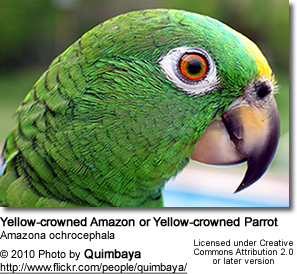 The yellow on the forehead is far less yellow than that of the Double Yellow-head parrot (Amazona oratrix). The wings are spectacular, as the primaries exhibit a lovely violet-blue, with secondaries (shorter, upper "arm" feathers) also possessing this striking violet-blue at the tips and outer webs; and there are red markings appear at the bend of the wing, while a yellowish green color marks the edges. The red and dark blue markings are often difficult to see when the bird is perched. The tail has a yellowish green base with red tail feathers. They have a light bone beak and light gray feet. 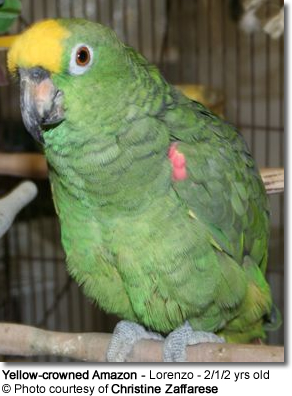 The cheeks and ear coverts (feathers covering the ears) are green. The eyes are marked by orange irises and white eye-rings. They have a dark bill with a large horn or reddish spot on the upper mandible except panamensis, which has a horn colored beak. Sexing: Males and females look alike. DNA sexing is recommended for breeder birds. Immature Yellow Crowns exhibit the same colors as the mature adults, but they are typically more muted, and the yellow is not as developed, except at the lores and crown. Except for the wing speculum (= distinctive wing patch), juveniles have little yellow and red to the plumage. The Yellow-crowned Amazon parrots are known for their playful antics and excellent talking abilities. This being said, talking ability will vary between birds and even though many of them are excellent talkers, some may never learn to talk. They are handsome and generally affectionate. Their friendly and playful nature make them excellent pets. They are easily tamed and trained and are known to be very active - which makes them more suitable to an environment that allows them to fly and move around, such as an aviary or flight. Provided they are given sufficient daily exercise, they can adjust to indoor cages and indoor living as well. 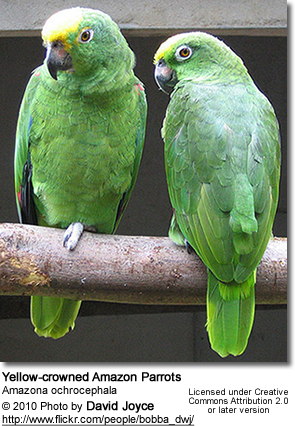 They are known for their loud voices, which is said to be the loudest of all Amazon Parrots. People who are not tolerant to noise, will not do well with this parrot. Like most larger parrots they can also be very destructive and their need to "customize their environment" needs to be redirected by providing them plenty of chewing toys and branches. Their diet includes a variety of fruits, nuts, seeds and berries. These parrots are normally found in pairs or small flocks up to 30, but larger groups may gather at clay licks. Bird Nutrition ... To learn more about the diet of the captive Amazon Parrot, please visit this webpage. 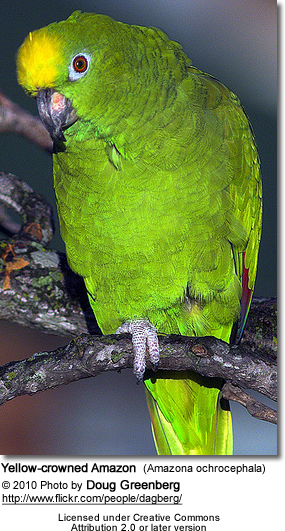 The Yellow-crowned Amazon parrots mate for life. The breeding season commences in early spring. In their natural habitat, they are cavity nesters. They typically nest in a hollow in a tree, palm or termite mounts, where they lay two to three eggs. The incubation time is about 26 - 28 days, and the chicks leave the nest about 60 days from hatching. This species is currently considered to be of least concern by BirdLife International, and, consequently, also by IUCN. Although populations are believed to be in decline they do not yet approach the threshold specified by BirdLife International to rate the species as Near Threatened. It is listed on Appendix II of CITES.